One of the most successfully renowned bridging finance companies in the UK, Supreme Finance have announced that they will be extending their lending limit to £5 million per borrower. This increases the amount of opportunities available for the commercial borrower drastically. The specialist bridging lender has secured a separate funding line with Blue water Corporation which offers an initial facility of £50 million pounds which will grow over the course of the next 12 months to £100M. As bridging loans become increasingly popular in this modern age of recession, Supreme are once again leading the way for others to follow suit. 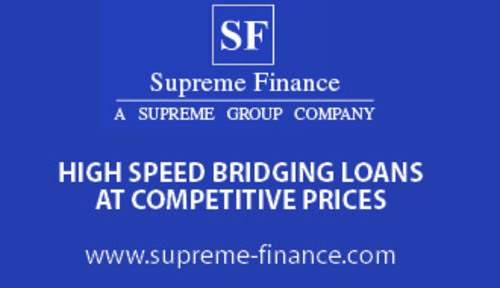 Unlike brokers, Supreme Finance only lend money which is their own, making them one of the largest and reputable principal lenders in the nation. The loans available for commercial borrowers and developers are ideal for an individual or company whom wishes to purchase property to sell or rent out at an auction. Such terms of auction finance involve a staggering 24 hour decision time, with the money being transferred at 48 hours. Other benefits of attaining property finance from Supreme Finance are that this process is a very quick and easy one. They give people and companies a like the potential to become cash buyers with the financial backing and support necessary. This becomes the ideal short-term solution to funding projects such as refurbishments and enhancements and provides borrowers with quick decisions and timely payments. 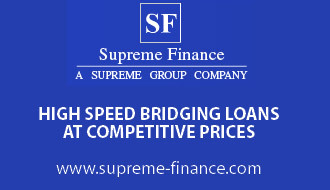 As this is much faster than mortgage lenders, Supreme Finance are demonstrating why obtaining a bridging loan is a much more viable option for many. The increased lending limit gives property developers an extended amount of commercial finance, (helping them to secure large property portfolio’s) aiding them in the implementation of large scale housing, such as a block of flats or apartments. The standard of excellence that is set by Supreme Finance is renowned across the UK and parts of Europe. This organisation of expert investors has been assisting the build and restoration of many homes, in Great Britain and have been driven towards a goal of changing the financial and property market to be adaptable around this modern day. Few principle lenders have as much understanding with their clients as Supreme Finance, which is why they are continuously seeking to create innovative methods of aiding developments and the financial budget. The darkened days of the recession has forced bankers to refuse the financial aid that so many companies need, and this has created a flux in the development market. Without Supreme Finance, many enhancement projects would become moribund and dwindle until the idea is merely a dream. Fortunately, Supreme has been established and are currently leading the way for other lenders to follow suit. The increasingly high lending limit has brought with it a surge of development projects and hope for people and companies that they may not otherwise have had. This press release was distributed by ResponseSource Press Release Wire on behalf of Supreme Finance Ltd in the following categories: Personal Finance, Business & Finance, for more information visit https://pressreleasewire.responsesource.com/about.